Medical transcription is a sensitive need that commands the utmost care and expertise. In today’s technology-driven world, healthcare facilities and practitioners rely heavily on digital aids ranging from handheld dictation recorders to electronic health record systems, as generating comprehensive medical reports is mandatory in various countries such as US and Canada. The dynamics give birth to an incessant need to interpret and transcribe multiple dictations, and that too in remarkably quick turnarounds. That is when you need a medical transcription specialist such as Allied Infoline. 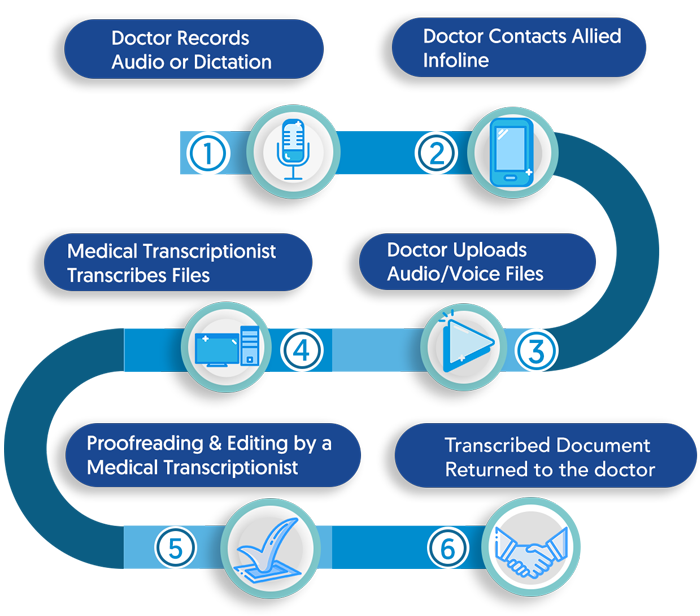 Driven by a team of seasoned medical transcriptionists with more than a decade of experience and intensive training in medical terminologies, we promise fast turnarounds, flawless quality, and unmatched value. Acknowledging the criticality and confidentiality of medical records, we always review transcripts before sending it back to the client as we understand even a small error can make a huge difference. Our undivided focus on delivering superlative quality clearly reflects in our growing base of satisfied clients that have invested their trust in out medical transcription services. Wisht to Learn More? Speak with Us! When selecting a medical transcription services company, it goes without saying that you would have some questions and concerns. To learn more about our medical transcription services or discuss your requirement or fill out our contact form. You can also write to us at sales@alliedinfoline.com.